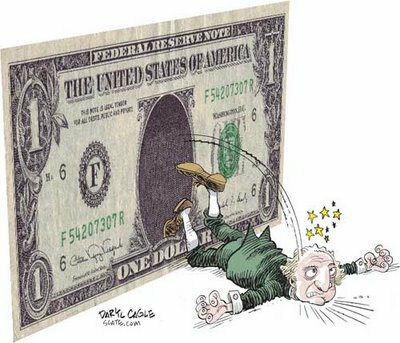 The US dollar fell against most of the major and emerging market currencies for the second consecutive week. The combination of market positioning, weak confidence that the Fed will hike rates this year, and the rise in some industrial commodities seemed to be the main drivers. Technical considerations warn of scope for additional dollar losses in the coming sessions. Among the major currencies, the Australian and New Zealand dollars did best. Both appreciated by about 4% against the greenback. The RBA signaled no strong urgency to cut rates again, and New Zealand drew succor from a recovery in milk prices. The yen was the weakest of the majors. It lost about 0.3% and was the only major currency to lose ground against the dollar. The equity rally and the modest 3-4 bp rise in US yields took weighed on the yen and given the strength of the relatively high-yielding Aussie and Kiwi, there was much talk about renewed use of the yen as a funding currency (carry trades). The Dollar Index fell through the trend line drawn off the spike lows on August 24 and September 18. It held on October 8 but convincingly broke before the weekend. The trendline is near 95.10 and rises toward 95.50 by the end of next week. A break of 94.60 targets 94.00-94.20. A push through 94.00 would be an ominous development, signaling a test on 92.60 low from late-August, but possibly even toward 91.30, the measuring objective of the possible double top carved out in August and September. In a similar fashion, the euro has moved above the down trendline connecting the August 24 and September 18 highs. It came in near $1.1280 before the weekend and fell toward $1.1200 by the end of next week. The immediate target is $1.1400 and then $1.1475. The RSI and MACDs suggest that further euro gains are likely. From a longer-term perspective, note that after falling from around $1.40 in May 2014 to $1.04 in March 2015, the euro has been trading broadly sideways in the trough, unable to retrace even 38.2% of its decline (which would bring it to $1.18). We note that the 50, 100, and 200-day moving averages are converging in the $1.1150-$1.1200 range. We had been suggesting that the dollar was carving out a symmetrical triangle against the yen since late-August. However, it is getting too close to the apex to be of much use for a technical perspective. Nevertheless, the sideways consolidation continues. The extended range trading has neutralized the RSI and MACDs. We note that the distance between the upper and lower Bollinger Bands is the narrowest it has been for almost two decades. It suggests that even if the triangle pattern is not longer valid, the dollar is coiling against the yen. It warns that a large move may be on the horizon. Although the direction of the move is debatable, a break of the JPY118.60-JPY121.50 range should not be faded. After the yen, sterling was the weakest of the majors, appreciating almost 0.9% against the US dollar. Sterling has been particularly streaky lately. The most recent streak is up. It can be illustrated by the fact that it has recorded higher lows and higher highs for six consecutive sessions. We are less sanguine. Sterling remains well below the same trendline we saw in the euro and the Dollar Index (drawn off the August 25 and September 18 high). It is found near $1.5500 at the end of next week. Sterling tested a key chart point before the weekend, and this stymied the upside momentum. The $1.5380 area corresponds to a 38.2% retracement of down move since August 25, and to the 50% retracement of the decline since September 18. A move above there could spur a move to $1.5465 and maybe close to the trendline. Support is likely to be seen in the $1.5230-$1.5260 area. The stabilization of the US dollar against the Canadian dollar at midweek was not the beginning of a bottom, but it was almost as if it was the market taking a breath before pushing the greenback lower ahead of the weekend. It may have been egged on the extension of the oil market rally, but it had to overlook a 61.9k full-time job loss, which offset and more the 54.4k increase in August. Canada lost nearly 25k full-time positions in Q3. The US dollar approached its 100-day average just below CAD1.2900 before the weekend. A break of this could spur a move toward CAD1.2800. The move has been a bit sharp and left the US dollar below the a little below the lower Bollinger Band (~CAD1.2955). The Australian dollar enjoys strong upside momentum. That momentum has lifted it beyond its upper Bollinger Band. Other technical indicators suggest that the advance can continue. The close above last month's high (~$0.7280) lifts the medium-term outlook. The immediate potential extends toward $0.7380-$0.7400, but given market positioning and the swing in sentiment, the Aussie could move into the $0.7500-$0.7600 area before the correction is over. The November light crude oil futures contract rallied 9% last week to almost $51.00, its best level since late July. Although prices reversed lower, the contract still finished the week above its upper Bollinger Band ($49.40). A move above $51 could lift prices into $53-$56 area. A break of the $46-47 support band would warn that a high may be in place. The US 10-year yield rose 11 bp last week to almost 2.13% before easing to 2.09% at the close. The yield had spiked to 1.90% in response to the disappointing jobs data on October 2. It has to overcome the 2.15%-2.20% area to be anything of significance. The US two-year yields rose six bp last week. The bearish steepening (5 bp) can largely be explained via inflation expectations. The 10-year break-even rose four bp to 158 bp last week. The S&P 500 had a good week, one of the best of the year, rising almost 3% to its best level since mid-September. However, its failure to push through 2020 and the weak close blunted the positive technical picture. A move above there and the 2030-2040 area comes into view. The price action over the past two months has taken the shape of a "W" which is recognized as a bullish pattern. The 2020 area is the key to it. On the other hand, a break of the 1955-1960 area may be a sign that market has given up on it. 1. Gross speculative position adjustments in the currency futures were mostly minor. Of the 16 gross currency positions we track, ten changed by less than 5k contracts in the CFTC reporting week ending October 6. Eleven of the 16 gross position adjustments were to reduce exposure. Gross longs were only increased in the euro and Mexican peso. Gross shorts were increased in the euro, Swiss franc and sterling. 2. Speculators covered short Australian and Canadian dollar positions in size. The gross short Australian dollar position was cut by 11k contracts, leaving 82.4k. The gross longs were reduced by 3k contracts. The gross short Canadian dollar futures position was cut by 14.2k contracts to 64.3k. The longs were cut by 6.9k contracts. The reduced shorts and longs are not indicative of new carry trades that some suspected was behind the rally of the dollar-bloc currencies. It was a short-covering not new buying. 3. The speculative position adjustment in the Mexican peso was the most dramatic. The net short position plummeted to 5.2k contracts from 44.5k. Speculators were net short 88.8k peso futures contracts at the end of July. It was the result of a 19.7k contract surge in gross longs to 50.9k and a 19.5k cut in gross short positions, leaving 19.5k. The gross long position bottomed near 18k contracts in mid-August. The gross short position peaked at the end of July near 111k contracts. 4. The net long speculative light crude oil futures position was grown by 6.5k contracts to 258.3k. Speculators added to both gross long (9.6k contracts) and gross short (3.1k contracts) positions. 5. After one-week net long, speculators shifted to a net short US 10-year Treasury futures position. The bulls took a some profits, liquidating 7.7k futures contracts leaving 450.9k. The bears sold into the rally and added 17.3k short contracts. It now stands at 453.9k.